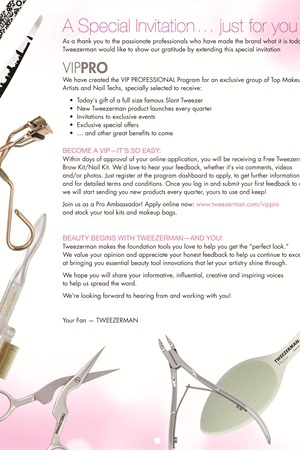 To thank the passionate professionals who have made Tweezerman the brand it is today, the company has created the VIP Professional Program. An exclusive group of top nail techs and makeup artists will be selected to receive the gift of a Nail or Brow Kit and new Tweezerman product launches every quarter. VIPs will also receive invitations to exclusive events and exclusive special offers. For more information, go to www.tweezerman.com/VIPPro.